Heat oven to 350°F. Grease baking sheet with the shortening. Unroll cinnamon roll dough, cinnamon side up. Set icing aside. 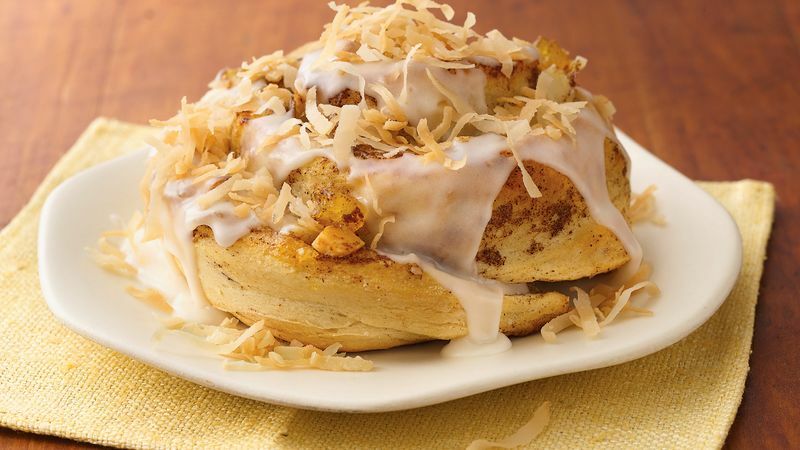 Spoon pineapple topping evenly over cinnamon rolls. Sprinkle nuts over pineapple topping. Reroll dough into pinwheel shape; separate into 5 rolls. Place 2 inches apart on cookie sheet. Bake 20 to 23 minutes or until golden brown. Pour icing into small bowl; stir in rum. Spread icing on rolls; sprinkle with coconut. Place on serving platter; garnish with pineapple rings and mint. *To toast coconut, heat oven to 350°F. Spread coconut in ungreased shallow pan. Bake uncovered 5 to 7 minutes, stirring occasionally, until golden brown. High Altitude (3500-6500 ft): Heat oven to 325°F. Decrease pineapple topping to 1/4 cup. Bake 22 to 25 minutes.